Two personalised bottles Label of Wine. One bottle of Wine Chardonnay Cote De Gascogne white. 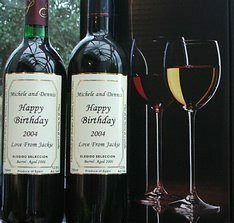 One bottle of Wine Merlot red wine gift ideas birthday and anniversary. If this is a special gift you can pick the delivery date after you checkout. You can also mix the wine i.e two red or white. A unique gift idea. Your message on the label of a bottle of Champagne delivered by courier. Say whatever you want to say on the label, Happy Birthday, Congratulations, Valentines gift, Thank You and the name.